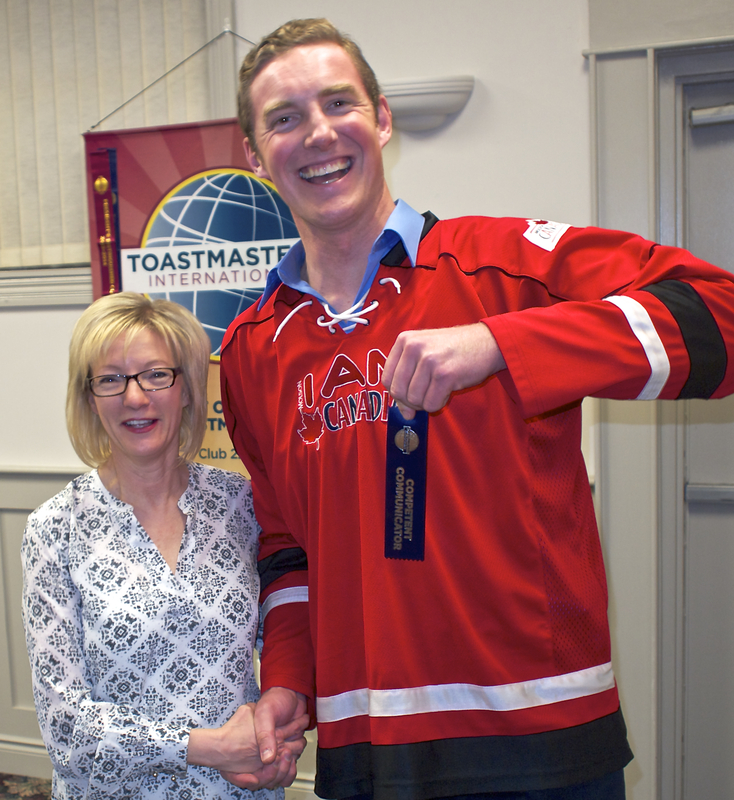 Mayor Rob Burton brought greetings from the Town of Oakville at last night’s A+ meeting of First Oakville Toastmasters. The mayor gave a short address at the beginning of the regular meeting. We were fortunate to have a photographer from Oakville’s Snap news magazine. First Oakville members warmly greeted our mayor and listened intently to his speech (which was pretty good in Toastmaster terms). In Photo: Brampston Gushway, our VP of PR; President Adrian Scott; Mayor Burton; and former club president Sharon Jenkins. Another highlight of the meeting was the awarding of a Competent Toastmaster designation to our own Allan Osborne whose speech last night garnered a rare and well deserved standing ovation from his fellow Toastmasters. Congratulations to our vice president of public relations for arranging for the mayor’s attendance and making the arrangements for the photographer from Snap. All in all, one of the best nights of the year so far. Our next big event is our annual Charter Party on Feb. 14 at the Bronte Harbour Restaurant. Tickets are still available. Guests are always welcome at First Oakville. We meet on Thursday evenings at the Knights of Columbus Hall on 1494 Wallace Rd. Please arrive around 7:15 pm and enjoy an evening of public speaking and education.